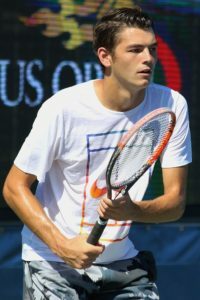 San Diego native Taylor Fritz won his first Grand Slam match and ousted Marcos Baghdatis on Wednesday at the US Open in straight sets. The 19-year-old wild card beat Baghdatis, 6-4 6-4 6-3, in the first round of the tournament. The 108th-ranked Fritz out played the 83rd-ranked Cypriot. Fritz saved eight break points in the match and converted five of his own in the win. Fritz, who now lives in Palos Verdes, will face sixth-seeded Austrian Dominic Thiem in the second round. Thiem defeated Australian Alex De Minaur 6-4 6-1 6-1 in his opening match. The Baghdatis-Fritz match was originally scheduled for Tuesday but was delayed to Wednesday because of rain.